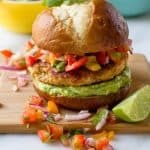 A secret ingredient keeps these Salsa Chicken Burgers moist, juicy, and tender! Combine all ingredients in a medium-size bowl, toss to combine. Refrigerate while preparing rest of recipe. Combine the avocado, cilantro, lime juice and zest, and garlic in the basin of a food processor. Pulse until mostly smooth. Add in the water, a few tablespoons at a time, and then pulse to combine. Continue adding water and pulsing until the sauce is the consistency of mayo. Season with salt and pepper. Set aside. Preheat a grill or a cast iron skillet to medium-high heat. Oil the grill grates or skillet liberally with cooking spay. Combine the chicken, cumin, chili powder, yogurt, breadcrumbs, Worcestershire, salt and pepper. The mixture will be wet. Form into four patties using damp hands. Cook the burgers on the preheated grill or skillet for 3-4 minutes, or until a golden brown crust forms and the burgers are easy to lift off. If they stick, they aren’t ready to flip. Flip, and cook on remaining side for an additional 2-3 minutes. To assemble burgers, slather the Cilantro-Avocado Sauce on the bottom of a bun. Place a burger patty on top, then pile on the salsa. Top with remaining burger bun half. Serve with lime wedges.